The 2011 French Open Tennis tournament is proving yet again that winning tennis matches is as much about the inner game of tennis as it is about the racquet or the level of player skill. Players have come from behind to win matches; tennis players who looked certain winners have lost focus or belief and ended up losing their tennis match. It's interesting, too, how Ivan Lendl, one of the really great tennis players, used to "choke" in finals. It took him a long time to gain the belief that he could win. Once he started winning finals, there was no stopping him - it became a habit until someone better arrived on the tennis scene. The barrier to his winning in the early part of his career was his own mind - the messages he gave himself. The inner game of tennis is about focus and concentration, internal resilience and self-belief (the capacity to maintain a positive attitude despite the odds). It's not only about the racquet or level of tennis skill! I was playing Pennant level tennis in a doubles tennis match one pleasant Sunday afternoon. Each tennis fixture team had four men and two women players so each male member played two men’s doubles and two mixed doubles. At Pennant level in tennis, you come up against State-ranked players. So my male partner and I ended up playing two other men, one of whom was ranked in the Top 20 in the State. He even had his own personal entourage and multiple racquets to reinforce his status. We started off badly, with the State-ranked player winning his service game to love and before we knew it we were down 3-0 in games. That was bad enough, but our opponent’s entourage would laugh at us whenever their State-ranked player won a point. He had a big top-spin serve that forced you off the court if you were standing behind the baseline to receive the serve. It meant that he could come into the net and put your return away with ease. By this stage, I became angry with the goings-on off the court and the general lack of respect that existed in the opposition team. I always say control your anger on the tennis court or at least direct your aroused energy into some positive action. So I decided to change tack and put all my focus and energy into returning my ranked opponent’s serve. I stood between the service line and the baseline to receive the serve and was able to take the ball on the rise and drive it down at his feet as he came into the net. My partner, who had a great backhand, did the same from the backhand side. This really threw our opponent into a “tizz”. Our State-ranked opponent lost his serve to love and ended up turning to his entourage and saying, "I don't know where to serve, they are returning too well". We continued to attack his serve and that of his partner and we won 6 games in a row to take the match out 6-3. As the match progressed, his entourage started laughing at him and his partner (and not at us – they had no respect for anyone!). redirect negative energy such as anger and frustration into positive action. always treat your opponent with respect even if they are making a fool of themselves by their antics - don't get sucked into their "game" or lose your focus. Our State-ranked opponent continued to use the same strategy - he tried to blast us off the court with his fast, high-kicking first serve. Even when this was no longer working, he did not slow up his serve or attempt to place it better to put us at a disadvantage. He failed to demonstrate the inner game of tennis. 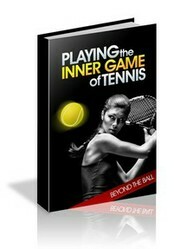 I have developed this e-Book by drawing on over 40 years of playing tennis, including at "A" Grade and Pennant level. These strategies for building your inner game of tennis are easy to implement but will make a profound effect on your game - just give one or more a go to increase your enjoyment from your tennis matches. CLICK HERE TO DOWNLOAD "PLAYING THE INNER GAME OF TENNIS"
Here are some strategies that I have found useful to help me build my inner game of tennis. Tai Chi: this is great sport and discipline for building coordination and balance (which are central to a sound tennis game). Fitness: builds mobility, physical resilience and inner discipline through the routine of exercise. Practice: builds self-awareness and confidence and moves your tennis skills (in the practised tennis strokes) to a level of unconscious competence (you use the stroke correctly and appropriately without having to think). Anticipate: developing the habit of anticipating your opponent's actions during a tennis match sets up an internal feedback loop which enables you to modify your strokes and adjust your game (e.g. watching your opponents service action - how they address the ball, the speed of the tennis racquet head and their body movement). Be Flexible: develop a flexible approach to your game so that you can adjust to meet the challenge of different opponents and change your tennis game plan accordingly (one game plan does not fit all occasions). Focus: learn to concentrate and maintain focus in your endeavors off the court and this will carry over to your on-court behavior. Breathing: use controlled breathing to center yourself and utilize the full power of your tennis stroke (you can do this as you are about to receive a serve, timing the outbreath to match your stroke). Acknowledge: give yourself recognition for a good stroke and don't berate yourself for poor tennis strokes (concentrate on the positive and build self-belief). Be-in-the-moment: stay in the moment and don't get ahead of yourself in your tennis match - this means playing each point as it happens (not anticipating the next point). Manage Emotions: stay in control of your emotions and learn to convert negative energy (frustration) into positive action. Visualize: use the power of visualization to build self-belief and self-efficacy. Michey - very valid point - the inner game of tennis has a lot to do with living a fulfilling life. My choices for the french Open are Li and Federer. What would it do for tennis in China if Li won. I think the inner game of tennis will play a big part in the women's final - whether or not Li can maintain her level of self-belief she has demonstrated so far. Schiavone proved last year that she has an almost indomitable will and incredible power of concentration. Ron, I like the idea of "redirect negative energy ... into positive energy"... it is applicable in a lot of other activities as well. So very important are: the attitude, determination, and believing in ourselves. Tomorrow we will have again a final with the best Nadal - Federer, In the woman part, with number 1 and 2 out... it is a huge window of opportunity. I think LI is going to fight hard, and she has a chance regardless the fact that the opponent has more experience. Very important tips, redirecting one's focus is a valuable asset. I guess you could call me a tennis addict. Although I no longer play, I am stuck to the TV when the Majors are on, particularly Wimbledon. Ron, a lot of these tips work for golf and life in general as well. Great advice! Had a few similar experiences myself and in the end always resorted to singing Hey Jude. Worked wonders. Great page and an important lesson in life as well as tennis. Have you ever noticed how some people are bat and ball players while others need to be able run and kick? Very odd. I used to have a boyfriend who was a bat and ball player - didn't matter what the game was or if he'd played it before he was always confident that he'd be able to play it. Mind you he also used to play Real Tennis which is an ace game for watching older players stand still while hitting the ball all over the court and generally giving the younger more athletic players the run around! Now there's a lesson in how to be efficient and effective! Yesss...I'm great with spatulas! Consider yourself challenged! Achim - I can't help you there, but I think the same principles apply. I learned very early that table ping-pong is "not about the bat". I started playing a game against my brother-in-law and he insisted I play left handed (I'm right-handed). When I won, he gave me a spatula (flexible blade used to spread plaster) to play with instead of a bat. I still beat him - so it's all in the head (and hand) not the bat! Can you make a page about the inner game of ping-pong? The online version, I mean.